Novelty drinking horn for parties and special events. Stainless steel outer ring is engraved with "Das Horn"
My 31-year-old son, who loves beer, loves this! My future son in law loved it! Good quality and got it fast. The drinking horn dates back to the Classical Age. Even during the Middle Ages, horns were used as drinking vessels for ceremonial purposes, feasts, and celebrations. From a company called Das Horn, co-founded by David Segall and Alex Chatham, comes a celebratory drinking horn for the modern age. Move over pint glasses, flasks, and (gasp) disposable cups—make way for an eco-friendly alternative full of fun and spirit. Das Horn is shaped like a horn, but made out of BPA-free plastic and adorned with a stainless steel rim for your drinking pleasure. 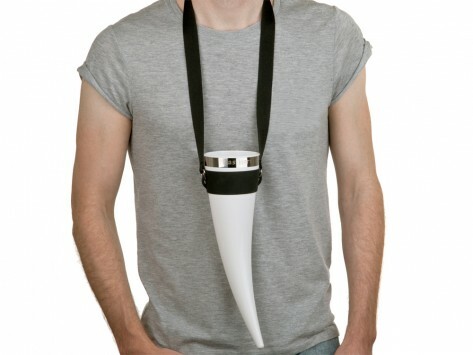 Designed to be worn around your neck for easy access and hands-free fun or displayed on a pedestal like a trophy, Das Horn lets you take the party by the horn and go wild without harming any animals in the process.